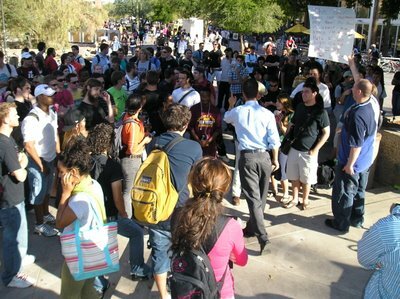 An unbelievable amount of students flocked to hear the preaching of the Word of God at Arizona State University for a total of four days straight, and every day was filled with lots of excitment. We preached hard against sin and exalted the Lordship of Christ Jesus. During the first day of meetings I had water poured all over me as I was speaking. Likewise on the second day, someone threw water all over me again. The police demanded that we take down our banner for fear that someone might us the metal poles as weapons. The picture above is super funny. 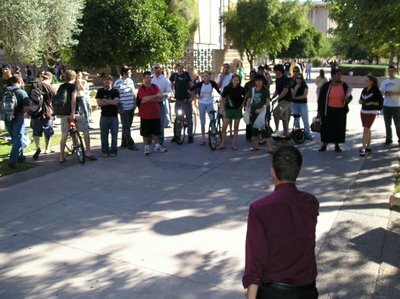 I had just passed the floor over to brother Evan when this mild-mannered Christian in a yellow shirt stepped up and started addressing the students. 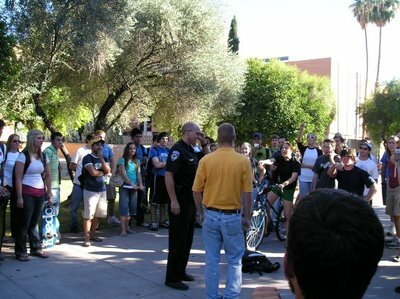 At that very moment the police stormed in and began interrogating the yellow shirted guy thinking he was the cause of the all the commotion while Miles, myself and Evan stood quietly to the side trying not to laugh... You can see the students screaming at the officer and pointing in our direction. It was a genuine classic moment. 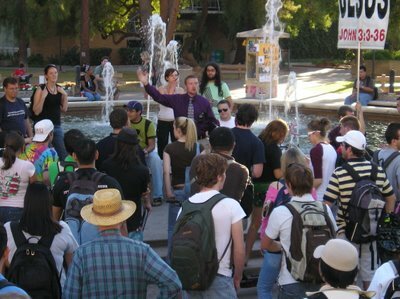 The police told us we had to move because the crowd was too large and was blocking traffic so we set up by a fountain near the student union building. While Miles was preaching, an irate muslim nearly attacked him. This crazed man was cursing and swearing, saying: "Christians, Jews and athiests are all cursed!" and "I hope Bin Laden kills you, because I'm for him!" Some sort of new age buddhist guy began meditating against us during the meeting, and then he tried to stare me down... but I simply quoted Scripture to him and he began to get very angry. 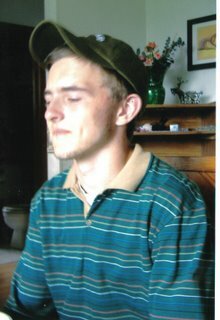 So much for inner peace... he was exposed for the sinner that he was. 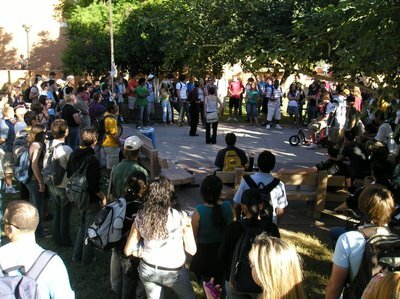 Many Christians showed up to hear the preaching as well. 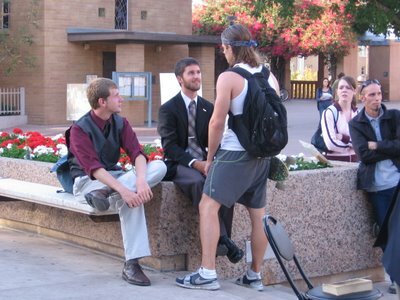 On the fourth day, two brothers were inspired and began preaching themselves at another location on campus. 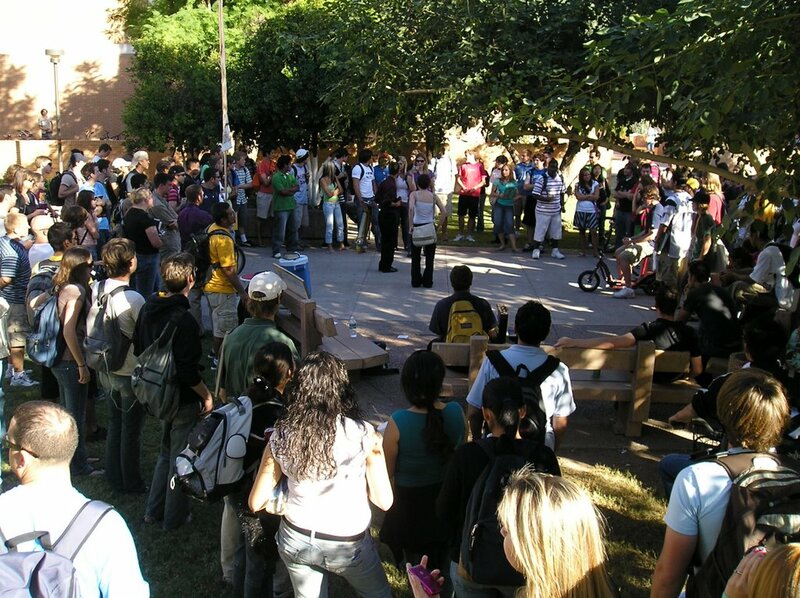 For the most part, the believers on campus received us well. "Whosoever shall receive one of such children in my name, receiveth me: and whosoever shall receive me, receiveth not me, but him that sent me." 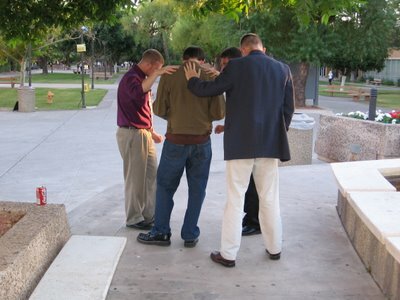 (Mark 9:37) We also took several athiests out to dinner on the final day. The girl above refused to believe that the Bible condemns homosexuality, and stomped up to read it for herself. After seeing with her own eyes the word of Scripture, she slapped the Bible down and said, "That's why I don't believe the Bible." People like her pick and choose what they want to believe to suit their sin and make them feel good. She's a perfect example of a rebel against God. On the other hand, this man below realized his sin and instead of justifying it or cursing God, he chose to repent and get his life right with God. A perfect example of a humble and contrite heart. God bless dear readers. May the Lord continue to bless you through these updates, and may God pour out His Spirit upon us all. Please pray for us that we would remain focused and strengthened as we carry out the final weeks of the first half of our journey. I know that I am beginning now to feel tired and am looking forward to Christmas break. God has been so good thus far in giving me strength and health; the joy of the Lord is my strength! I am confident that the Lord will supply all of my needs according to His riches in glory by Christ Jesus, and through your faithful prayers. Thank you all. awesome brother! Can't wait to see you back home! Keep starring the devil right in the eyes, he'll fold. Drown him in a flood of the saviours blood! Hi Eli: Just wanted to lety you know that I think you ae in my prayers and I wish you all of the success and blessings that Jesus has for you and the group that you are traveling with. continue to preach the Uncompromising word of God which is the only revealed truth of God and his Purpose for Himanity. I thank God for you guys! Your stories and accounts bless me brother! Keep up the good work and tell Miles and Evan I said hi!